Glaucoma is a disease that damages the optic nerve. Like a cable wire, the optic nerve is responsible for carrying the images from our eyes to our brain. Damage to the optic can occur when the pressure within the eye increases, usually due to the build-up of fluid inside the eye. As the optic nerve degenerates, blind spots develop in the peripheral (side) vision. Because the blind spots are usually in the outer visual field, they go unnoticed. The most common cause of nerve damage is high intraocular pressure (eye pressure). Once the nerve is damaged, it cannot be replaced or repaired. With early detection and proper treatment, total blindness from glaucoma is uncommon. Over 3 million Americans (67 million people worldwide) are affected by glaucoma. Half of those with glaucoma are not aware of it. Glaucoma has been called the “silent thief of sight” because there are no warning signs until significant nerve damage and vision loss has occurred. Dr. Bergstrom has the necessary tools to treat this disease and is experienced in the treatment of all stages of glaucoma. 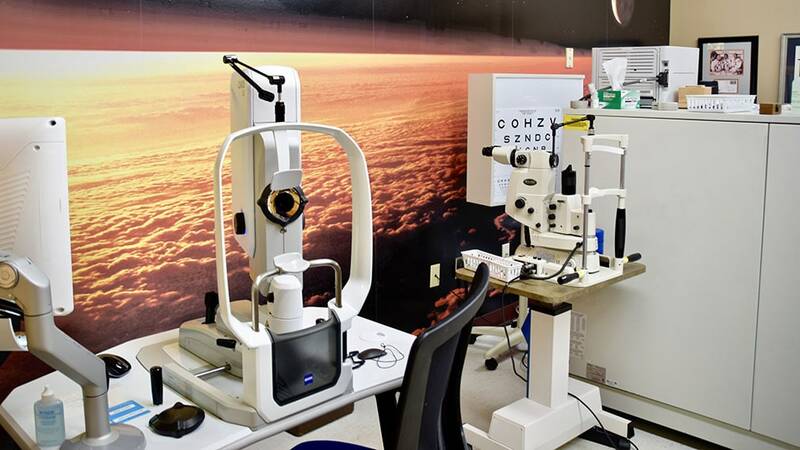 Bergstrom Eye & Laser Clinic uses the latest, most advanced technology available to detect and diagnose glaucoma, including the regions first HRT and advanced OCT. Unfortunately, most glaucoma has no noticeable early symptoms. Usually, the eye pressure is not high enough to “feel” unless it is very high. Vision loss usually takes years to progress to the point someone can notice the blind spots. Symptoms of glaucoma can include blurring of vision, halos around lights, and a feeling of pressure or pain around the eye. This usually occurs from wide fluctuations in eye pressure or a rapid rise in eye pressure. Most glaucoma treatments are aimed at consistently lowering intraocular pressure. Eye drops, oral medications, laser treatment, and surgery can be used to lower intraocular pressure. 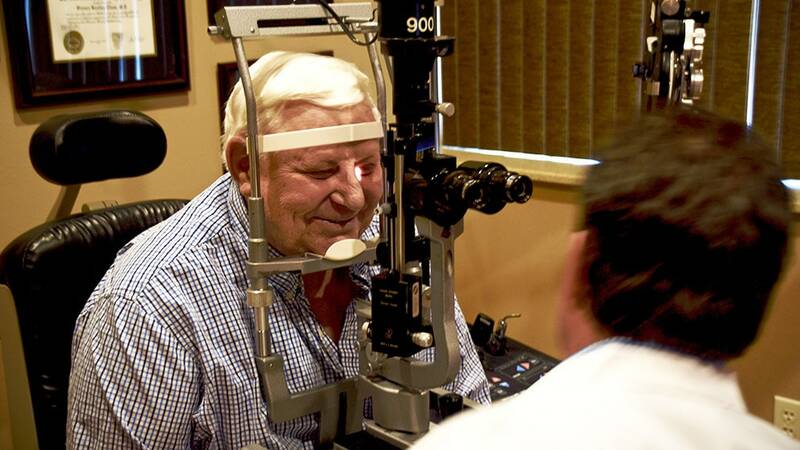 These treatments do not “cure” glaucoma but help control the disease. Eye Drops are the most common treatment for glaucoma. Eye drops work to either decrease the amount of fluid the eye makes or increases the outflow of fluid. It is important to use eye drops as they are prescribed and not miss doses. Oral medications are some of the most powerful ways to lower intraocular pressure. They carry certain side effects that limit their use long term. Lasers are available to help lower eye pressure. Laser trabeculoplasty is the most common laser used for glaucoma and can be used in the early or middle stages of the disease. Lasers can often decrease or eliminate the need for eye drops. Surgery is available when medicines and lasers do not control the intraocular pressure. The most common types of glaucoma surgery either enhance the natural passageway for fluid to flow out of the eye or create a new passageway for fluid to flow out of the eye. Sometimes a tube or shunt is used to direct fluid out of the eye. Dr. Bergstrom is available for consultation, second opinions, and surgical management. Glaucoma can affect anyone, which is why it's important to receive regular, comprehensive eye examinations. Although anyone may be at risk for glaucoma, there are several factors that may increase your risk. Increased Intraocular Pressure (IOP) – Anyone who has been found to have an elevated intraocular pressure at a glaucoma screening or as part of a general eye examination is considered to be at risk for developing glaucoma. Increasing Age – The incidence of glaucoma increases as we get older. Typically the incidence of glaucoma becomes much more noticeable above the age of 40 years old. This is why routine eye examinations with glaucoma evaluation are recommended every 2 years above the age of 40, if there is no other family or medical history, and more often if there is a preexisting history of glaucoma in the family or other predisposing health factors. Race – People with Africa heritage tend to have certain genetic factors that cause a higher likelihood of developing glaucoma. High Blood Pressure – Those patients who are being medically treated for high blood pressure may be at greater risk for glaucoma due to the lowering of the blood pressure within the optic nerve. Family History of Glaucoma – If any other family members have been diagnosed with glaucoma, your risk of developing glaucoma increases considerably. This is particularly true for siblings of glaucoma patients, who have a 5-fold increase in risk for developing glaucoma. Diabetes – Anyone being treated for diabetes is considered to be at greater risk for glaucoma due to the general circulation problems associated with diabetes. Myopia (nearsightedness) – In general patients who are nearsighted have anatomical features that may increase the risk of glaucoma. Injury/Trauma To The Eye - Severe trauma, such as being hit in the eye, can result in immediate increased eye pressure or cause long-term damage to the eye. Dr. Bergstrom will weigh all of these factors before deciding whether you need treatment for glaucoma, or whether you should be monitored closely as a glaucoma suspect, meaning your risk of developing glaucoma is higher than normal, and you need to have regular eye examinations to detect the early signs of damage to the optic nerve. Additional information about Glaucoma can be found using the following links.